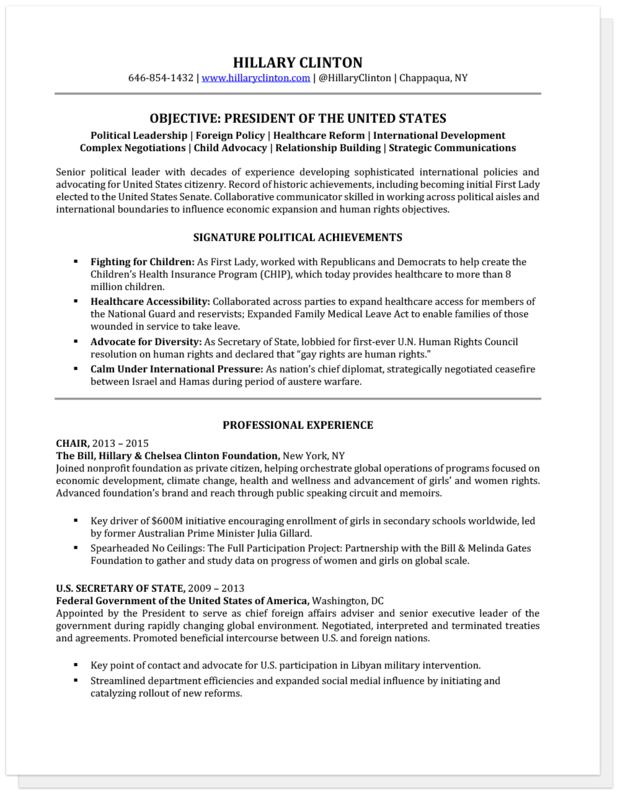 Whether you’re vying for the presidency or applying for a regular job, you can learn a thing or two from these unofficial resumes TopResume created for presidential candidates Hillary Clinton and Donald Trump. With arguably the most important job in the United States currently up for grabs, there’s no better time to dig into the personal branding of our presidential candidates. 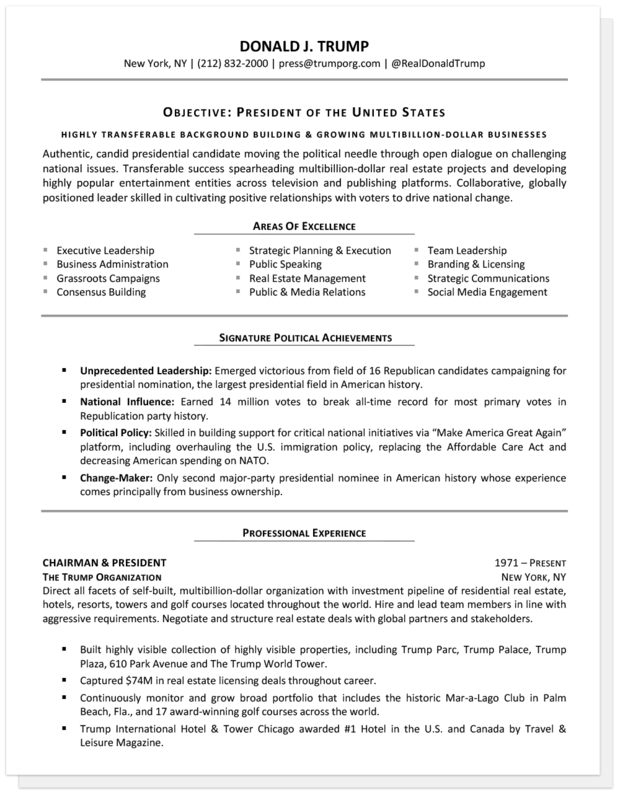 TopResume asked me to create unofficial executive resumes for presidential candidates Hillary Clinton and Donald Trump to show you, the people, the importance of selling yourself to employers in the job market. So print out a copy of your own executive resume and see how it stacks up with my resume tips below. Note: Click on the links above or scroll to the bottom of this article to view each candidate's resume. Just like in your resume, contact information is key. You want hiring managers to be able to find you, right? List out your city and state (no street address required), phone number and email address. If you’re in a creative field or have a rabid social media following – like The Donald – feel free to list those URLs too. Ditch the photo (unless you’re writing a CV) and focus on the meat. 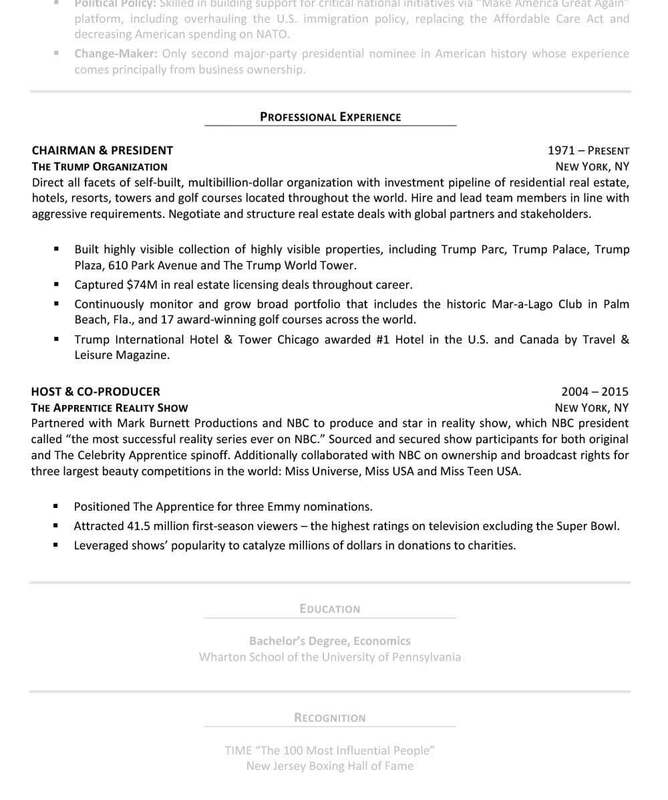 The executive summary is the most critical real estate on your resume, so use this section wisely. Incorporate key terms that recruiters in your field care about and overcome any objections the hiring manager may have with your candidacy by calling attention to your most attractive selling points. For instance, if you’re interested in making the jump from entrepreneur to a more structured job like Trump, you’ll need to highlight your most transferable skills and convince hiring managers that you’re okay with taking directions from someone else after so many years of running your own (reality) show. Most resumes pass through an electronic screen known as an applicant tracking system, or ATS for short, that helps employers determine if you’re likely to be a good match for their open position. Adding industry-specific keywords to your resume helps keep the ATS software happy and allows your resume to sail safely through their screens. It doesn’t matter how you list your areas of expertise or core competencies, so long as they make it into your resume. Also, don’t forget to expand upon these keywords throughout your executive resume. A trained recruiter or hiring manager will look for your professional experience sections to back up what you’re selling at the top of your resume. As Donald Trump would say, this section is YUGE! Rename it ‘Signature Achievements’ or ‘Highlighted Achievements’ for your own list of executive accomplishments and choose three to five to highlight. 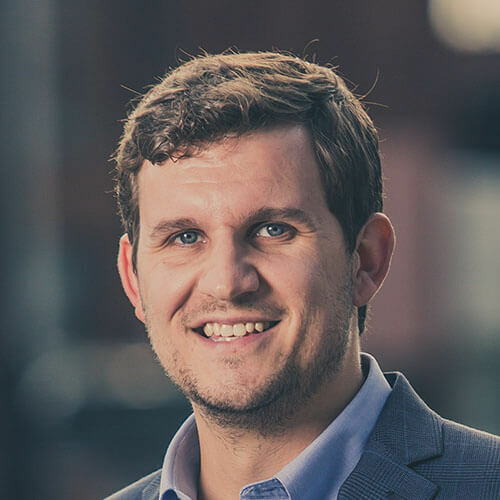 Building a section like this helps recruiters and hiring managers find your most important contributions without having to dig through your professional experience section. And after all, making easy work for recruiters and hiring managers is your goal. Lead with a bolded keyword or two and try to list plenty of quantifiable information (i.e. You spearheaded $45M revenue growth in a two-year period). Keep them punchy and concise for maximum impact. For the average the job seeker, we recommend listing only the past 10-15 years of your experience, as this is considered your most relevant career information. If you’d like to highlight experience that is older than this, you can do so with an ‘early career’ section near the bottom of your resume. Sometimes this isn’t necessarily an effective strategy at the executive level. Like the position of president (the average age of our past commanders-in-chief is 54), many executive roles are held by seasoned, senior-level professionals, so it’s okay to fill out a second page or list experience from the early 1990s. It’s best to cut it off there, though. We used a simple structure here. Clinton and Trump have been out of school for a while, so no need to list coursework, a GPA, projects, or business competitions. This is a tricky one. 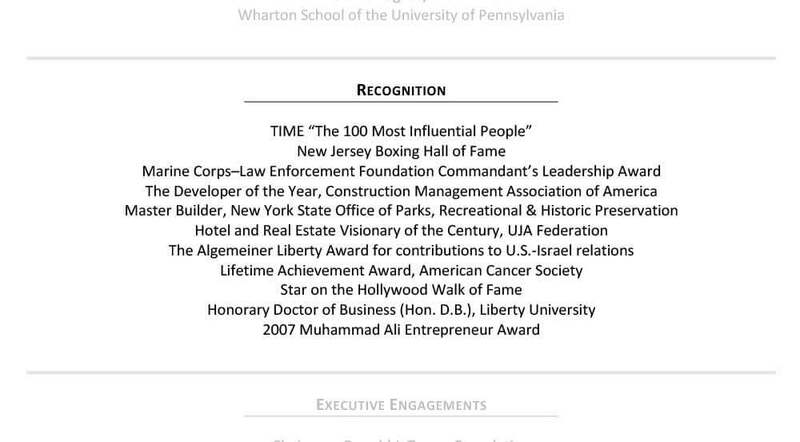 If you’ve been in politics or business for more than 30 years, like each of our presidential candidates have, you’re going to have a rather exhaustive list of awards. 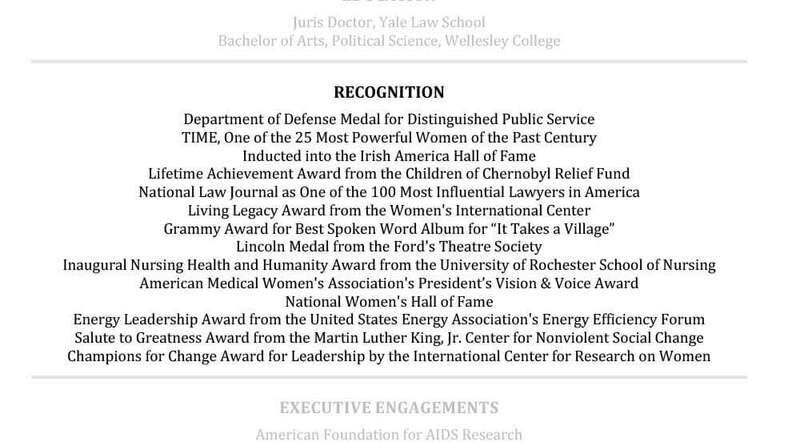 Seriously, while researching each candidate for this project, I found that Clinton and Trump have something like 1.5 billon awards between them (okay, maybe I’m exaggerating, but you get the picture). The key is to not overwhelm executive recruiters with your achievements. Think strategically and leverage your most impressive and relevant accolades. Again, your decades of executive experience will likely be peppered with board and community affiliations. But there’s no need to list your membership on a local youth tee-ball league (unless you’re looking for new opportunities in tee-ball, of course). Choose the most prominent boards you have chaired and include a line of achievements for each. Keep it simple and always make sure to end the resume with this type of information. It’s great interview fodder for employers and helps end your resume on a personal note. 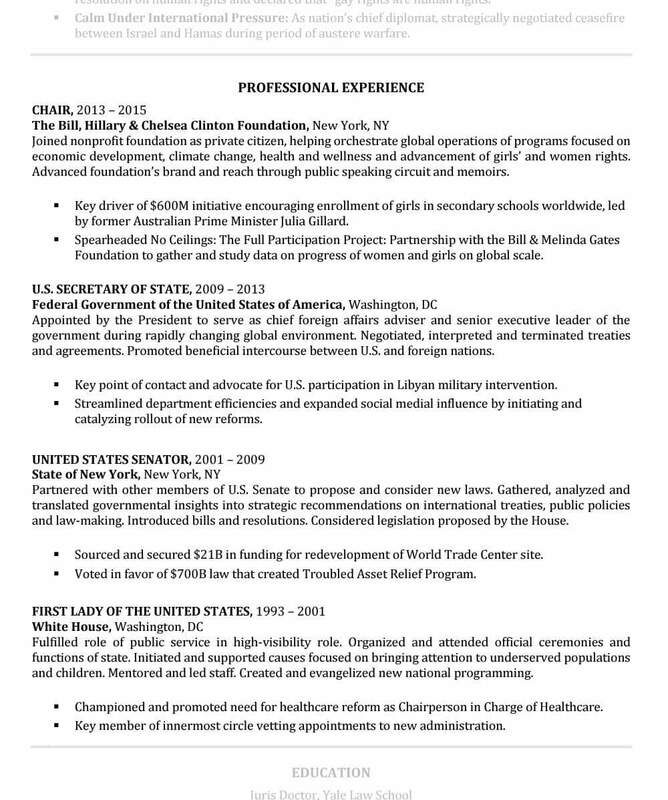 How does your executive resume stack up?